Time to grab your scissors and get crafty! 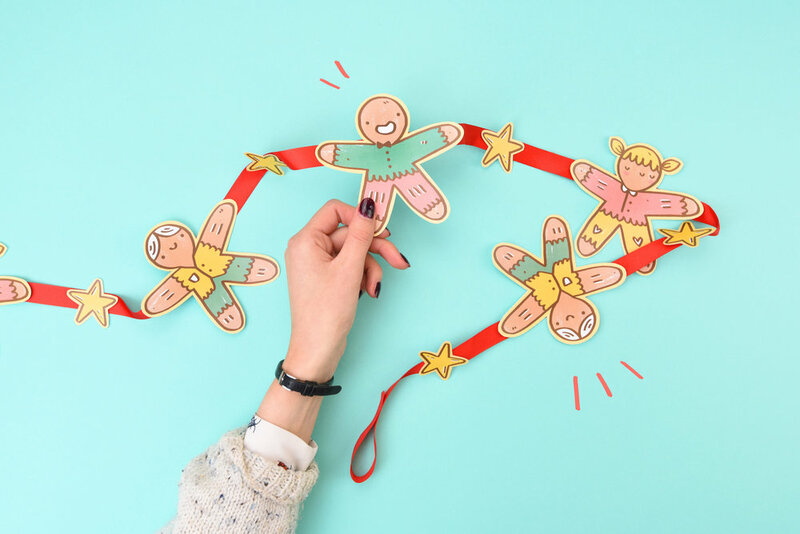 Follow the simple steps below to create a super cute gingerbread buddies garland! Perfect for hanging along the banister or in your room. Print out your garland using the download link above! Print this onto the 2 x A4 sheets of white card. Carefully cut around each shape using the dotted lines. Top tip - cut just inside the white line for a cleaner finish! Next cut your desired ribbon to length. Ours measures around 170 cm! If you want to add some looped ends to your garland to make it easier to hang, follow this step! Fold over around 5 cm of ribbon and glue it down on the other side. When doing this to the other end make sure you glue it on the same side as the other, else you'll end up with a twisted garland! Place the cut out's along the garland equally apart. Feel free to place them as far or as close as you wish! Using your glue gun, apply glue dots in the middle of each gingerbread arm and in the center of each star. Then simply stick them back in place along the garland! Wait for the glue to dry before hanging. Do not hang near open flames. YEY, IT'S READY TO HANG! Proud of your creation? Tag us in your festive photos with #ohhdeeradvent!